Sometimes you want to add a bold and dramatic touch to an otherwise large bland ceiling. By using Elite Moldings selection of large Ceiling Medallions you can change a ceiling from ordinary to extraordinary. All of our ceiling medallions are made from durable Poly Urethane which is both light and easy to paint. 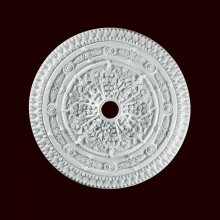 Using our patented Mold making process, we have been able to reproduce intricate designs taken from unique antique ceiling medallions. By using Poly Urethane we have been able to drop the cost significantly without compromising on both the quality and the look of the originals. Our large ceiling medallions are incredibly light considering their size and easy to install using nails or any quality construction adhesive. They come fully primed and ready to take any type of paint and are ideal for a faux finish which will only serve to enhance the crisp details of our ceiling medallions. 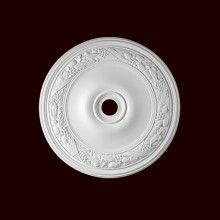 With our fast turnaround time you can expect your ceiling medallion to arrive within 4-5 days after the order is placed. Ceiling Medallion, Solid Ribbon & Reed 31"
Large Egg & Dart Ceiling Medallion 30"